Many of us will plan to accomplish a whole list of things in 2017. My list is usually the typical – go to the gym, eat healthier, save money, etc. But, this year I pledge to follow a career action plan and finally get some long term goals checked off my list. Use our 5 tips to help you land that new job, earn more money or simply celebrate your career successes! One of the most common resolutions is to get a raise or get promoted in order to increase your earning potential, and although this is an admirable goal, I encourage you to start a business project you can really take ownership of instead. Write that book you have always wanted, finally do something with your blog or focus on turning your side project into a profitable business. Did you notice that I replaced work/ life ‘balance’ with work/ life ‘integration’? This was not a typo, but rather a new way of looking at work as part of our 2017 new year’s resolutions. In order to be happier with your current job, try fitting your job into your life instead of fitting your life into your job. Learn a new skill and boost your professional development. Even better, learn a new skill that you can implement in your current job and help you get that promotion. I’ve wanted to learn how to properly use InDesign for years, but keep putting it off. This year, I’m going to start with free online training modules to slowly get up to speed. What new skill could you learn online? Meet new people and become a member of Women in PR. Networking is key to learning about future employment opportunities. Life is too short not to make meaningful connections. Be authentic, follow your passion, cultivate relationships and use social media networking to accelerate your connections. Building a strong support network can open up doors for opportunity and is one of the most influential things you can do for your career success. Read this article to learn how to make meaningful connections. Are you completely exhausted by the time you get home at the end of your work day? Me too! So how do you find hidden pockets of time for those extra money making projects? How can you possibly write that book you’ve always wanted to start? My plan is to buy a new journal and start making book notes whenever possible – on my commute, on my lunch break, relaxing and reflecting before bed. Make a goal to be ‘proactive’ instead of ‘reactive’. Not only will you reduce your daily stress, you will also appear more organized in the workplace and your boss will notice. 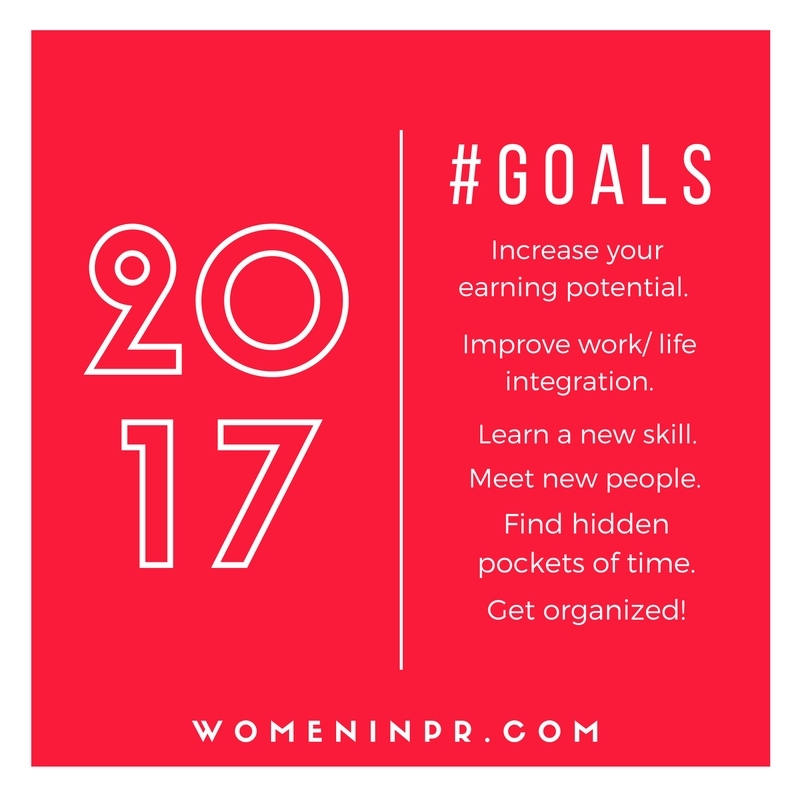 Buy an agenda for 2017 and use it to organize your appointments and your future to-do lists. Read this article for tips on scheduling your week. Do you have tips for our career action plan? We would love to hear from you – please comment below or email us to have your tips added to this list. Can you do me a favor and share this post? We’re here to help people, to inspire women in public relations. Reading this post may just help someone take that next big leap in their career!